Our 4" drainable louvers are available in several different blade configurations. Priced below is the 445D which has a high free area and a high initial water penetration level. We offer blades with more free area and blades with better water penetration values. All are available with channel frame or flange frame, both insect screen and bird screen options plus various sills and drip caps. Several finish options are available from 20 year Kynar, primed, Anodized, and Mill Finish. After selecting your size, click the "View Details Button" for spec sheets and information. If you can't find your size select a larger one, enter your desired size in hole size box. Reliable 4" 445RD Drainable Extruded Aluminum Louver 12" x 12", Mill Finsh, (for Painted go back and select Painted). Reliable 4" 445RD Drainable Extruded Aluminum Louver 12" x 14", Mill Finsh, (for Painted go back and select Painted). Reliable 4" 445RD Drainable Extruded Aluminum Louver 12" x 16", Mill Finsh, (for Painted go back and select Painted). Reliable 4" 445RD Drainable Extruded Aluminum Louver 12" x 18", Mill Finsh, (for Painted go back and select Painted). Reliable 4" 445RD Drainable Extruded Aluminum Louver 12" x 20", Mill Finsh, (for Painted go back and select Painted). Reliable 4" 445RD Drainable Extruded Aluminum Louver 12" x 22", Mill Finsh, (for Painted go back and select Painted). Reliable 4" 445RD Drainable Extruded Aluminum Louver 12" x 24", Mill Finsh, (for Painted go back and select Painted). Reliable 4" 445RD Drainable Extruded Aluminum Louver 12" x 26", Mill Finsh, (for Painted go back and select Painted). Reliable 4" 445RD Drainable Extruded Aluminum Louver 12" x 28", Mill Finsh, (for Painted go back and select Painted). Reliable 4" 445RD Drainable Extruded Aluminum Louver 12" x 30", Mill Finsh, (for Painted go back and select Painted). Reliable 4" 445RD Drainable Extruded Aluminum Louver 12" x 32", Mill Finsh, (for Painted go back and select Painted). Reliable 4" 445RD Drainable Extruded Aluminum Louver 12" x 34", Mill Finsh, (for Painted go back and select Painted). 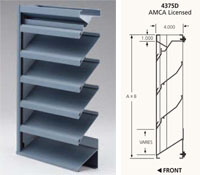 Reliable 4" 445RD Drainable Extruded Aluminum Louver 12" x 36", Mill Finsh, (for Painted go back and select Painted). Reliable 4" 445RD Drainable Extruded Aluminum Louver 12" x 38", Mill Finsh, (for Painted go back and select Painted). Reliable 4" 445RD Drainable Extruded Aluminum Louver 12" x 40", Mill Finsh, (for Painted go back and select Painted). Reliable 4" 445RD Drainable Extruded Aluminum Louver 12" x 42", Mill Finsh, (for Painted go back and select Painted). After selecting your size click the "Blue Hot Link" to see submittals and enter your specifications.